In a collaboration between the group of Prof. M. Kläui at Johannes Gutenberg University and Prof. S. Eisebitt at TU Berlin, a new X-ray holography method was developed that will enable snap-shots of dynamic processes at highest spatial resolution. 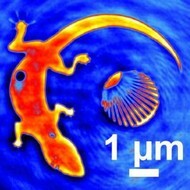 The efficiency of the new method is based on an X-ray focussing optics being firmly fixed to the object to be imaged. While this approach initially provides a blurry image, this can be focussed in the computer based on the hologram information. At the same time, the rigid connection between the object and the focussing optics elegantly solves the problem of vibration induced jitter that plays an enormous role at the nanometre scale. For X-ray holography, you need coherent light – light whose electromagnetic waves oscillate synchronously. This is the kind of light produced by lasers or by synchrotron sources. In the holographic process used here, part of the X-ray light falls on the object and part of it carries on through a pinhole aperture placed laterally beside the object to create the reference wave. A hologram is formed by superposing the two waves and recording the result with a detector. A holographic image of the illuminated object is then reconstructed on a computer. However, the pinhole aperture approach has a disadvantage. In order to produce a sharp image, the aperture must be very small, which therefore transmits too little light to create a good image from low-contrast objects or during short exposure times – a dilemma. Physicists including MAINZ PhD student Felix Büttner working in the collaboration headed by Prof. Eisebitt found a solution by using an optical element known as a Fresnel zone plate. This is placed in the plane of the object itself as a substitute for the pinhole aperture and considerably increases the brightness of the reference wave. However, the focal point of this optical element is not in the plane of the object (as the pinhole aperture would be), so that the image is out of focus. In contrast to photography, however, this blur in the image can be precisely corrected for via the information stored in the hologram. Due to the efficiency of the method, exposure times can be significantly reduced, allowing the study of fast dynamic processes. The well-known problem of jitter due to vibrations of the object in relation to the optics becomes increasingly dramatic at higher resolution of an optical system. In current research for high-resolution X-ray imaging, a resolution of less than ten nanometres is the target. That distance is tiny - less than a chain of one hundred single atoms. For that reason, even the smallest fluctuations are noticeable. However in the new approach the object is firmly coupled to the reference optics so that the lens fluctuates exactly synchronized with the object. This results in an x-ray camera with an automatic image stabilizer. The outline of the lizard serves as a test object, as well as the conventional test pattern, a section of a so called Siemens star. The lizard’s tail and the converging rays of the Siemens star can be used to measure how well narrow lines will be reproduced in an image. With a diameter of six thousandths of a millimetre, the entire test object is about the size of a red blood cell. The smallest resolved structure has a width of 46 nanometres. J. Geilhufe, F. Büttner, M. Kläui & S. Eisebitt, et al. The outline of the lizard serves as a test object, as well as the conventional test pattern, a section of a so called Siemens star. With a diameter of six thousandths of a millimetre, the entire test object is about the size of a red blood cell.